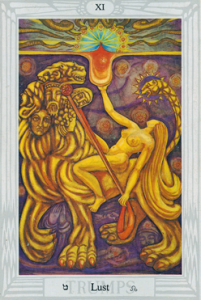 The 19th path of Teth the Lion-serpent connects Chesed, the sphere of Jupiter, with Geburah, the sphere of Mars, and is imaged forth by the Crowley-Harris Thoth Tarot key Lust XI. The path is called the Intelligence of the Secret of all Spiritual Activities or the Occult Intelligence. The 19th path of the Lion-serpent is the first that is wholly beneath the Abyss when descending, and the last before the Abyss when ascending the Tree. It is therefore the secret ruler and governor of all that is below, even as it receives the influence (mezla) from that which is above. The earlier versions of the 11th Tarot trump, such as the first printed Tarot of Marseille, depict a curious form of what the ancient Egyptians termed as the ‘Opening of the Mouth’. The woman appears to be forcing the mouth of a lion or other beast open. This is an image of the tearing open of the Gate of Knowledge, Da’ath—something that requires great spiritual strength and courage to do without suffering calamity, since there is a high risk of obsession by the flow of images on this high-powered path. The secret of the path is that visible nature veils or conceals the numinous source of all. The magical power of the 19th path is the Power of Training Wild Beasts, which is the art of deriving oracles from snakes and women. The power of hypnotism is also associated with the snake. The snake of light, or Lion-serpent, extends from the base of the spine to the medulla oblongata where the spinal column enters the brain at the back of the head. Occultly, the serpent then forms the third eye chakra. The secret of the 19th path is known to magi, and has been intuited by those that have travelled the intellectual path to its limits. To those seeking the realms beyond the Abyss, every bodhisattva is a lion in the road, an obstacle to the attainment of Gnosis. To be saved by Crowley is no better than being sent to hell by Jesus. Over the course of time, the letter teth evolved so that it came to mean ‘serpent’. Although the serpent of old times was always nahash, the letter was banished from the 24th path and nun, ‘a fish’ substituted. The repression of the serpent or Occult Force owed largely to the distortions of the biblical book of Genesis. The early Semitic and Cretan forms of the letter teth depicted the circle cross or Mark of the Beast. The symbol is identical to that used by the ancient Egyptians to show a terrestrial or astral location. The Mark of the Beast was also used as a protective amulet by the Egyptians, and was associated with Sekhet the lion goddess and Tauret the keeper of the Net, the starry cosmic matrix. The serpent and cross have always enjoyed a special relationship. The crossing of the 13th and 19th paths of the Tree forms the shadow or inverse reflection below the Abyss of the Calvary cross. The crossing of the two paths of the Moon of the Priestess and the Sun of the Lion-serpent form the special Mark of the Beast in the centre of the Unicursal Hexagram, a type of the Rosy Cross. The Unicursal Hexagram is alchemical, depicting the four elements of Fire, Earth, Water and Air, equilibrated by Spirit under the governance of Sol and Luna. The Moon was the earliest calendrical device. As the signature of time, periodicity, the Moon was the crown of Thoth or Tahuti (pronounce, djehuti). Thoth gave knowledge and magick to Isis after she followed the advice of her dark sister Nephthys. She was then able to stop the flow of time by appealing to Ra the Sun God. At the cessation of time at the crossroads, where the essences of the Woman and Beast intermingle (the 13th and 19th paths), Thoth was able to descend from heaven to earth in order to whisper magical words and spells into the ear of Isis. The tale of Isis and Ra was replicated, in corrupt form, in the apocryphal Book of Enoch, which describes how the sons of the Elohim descended to earth to copulate with the daughters of Eve. The sons of the Elohim then stayed with the women and taught them the knowledge of magick, alchemy and sciences. The congress produced a race of giants, ‘lofty ones’ or ‘noble men’ called the Nephalim. One is thy Beginning. One is thy Spirit. One is thy Transmutation. Visitae Interiora Terrae Rectificando Invenies Occultum Lapidum. The Adeptus is exhorted: ‘Go ye forth into the interior places of the earth. Seek out the hidden stone of the wise. By rectification, ye shall arise.’ The philosophic stone is thus found in the interior places of the earth, or Malkuth, hidden among the roots of the Tree of Life. Rectification means extracting the subtle from the gross, the gold from base metal and the elixir of life from among the poisons of the mind, which are as the excretions of the body. The Quintessence of all, summed up by ARARITA, is also known as the magical AZOTH, which is Alpha and Omega, the beginning and the end expressed in three languages. The end of time is with the beginning, and vice versa. AZOTH consists of Alpha and Omega, Aleph and Tav, A and Z. The Sun cradled by the Moon is a form of the Holy Graal, the cup of our Lady BABALON. On the 19th path, Nuit and Hadit, cosmic principles of space and consciousness, attain their material expression as Babalon riding the Lion, the Woman and the Beast. Eve and the Serpent in the Garden of Eden is a kindred image. The Egyptian ceremony of Opening the Mouth (of the deceased) enabled the king or Initiate to pass through the duat or underworld and traverse the fragrant paths of light that lead to the starry bowers of the garden of Nuit. Qabalistic knowledge adapted from The Flaming Sword Sepher Sephiroth, entry for the 19th number [Ordo Astri].